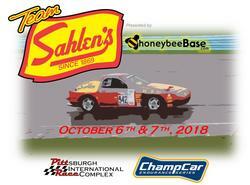 At last year’s ChampCar event at Pittsburgh International Race Complex, Team Sahlen was able to avenge for a disappointing near miss at victory in 2016 by securing the overall race victory. For 2018, Team Sahlen returns with high hopes of repeating as overall victors. At Team Sahlen’s most recent event with ChampCar at Watkins Glen International an Overall Victory was nearly secured. In Saturday’s 7 hour endure, Team Sahlen was sitting in a very good position in the lead of the race with 1 hour to go, when a full course red flag came out and stopped the race. The fortunate news is that no one was hurt in the incident. The unfortunate news for Team Sahlen was that this shortening of the race length saw several teams able to stretch their fuel to the end of the race while the team’s rotary rocket had to pit for a fill up. Despite this side step, Team Sahlen was able to roar back to take 3rd overall. Team has had 4 months off since they last competed in the ChampCar Endurance Series. In that time, the team has worked to continue to make enhancements to their Rotary Rockets. Friday will be open test time. Then Saturday will be an 8 hour endurance event. This will then be followed up by a 7 hour endurance event on Sunday.